This week the NC Real Estate Commission warned listing brokers (again) to stop using the square footing in the tax records in their listings. It remains a sad commentary on the profession for so many listing brokers to continue advertising this material fact in violation of Commission guidelines. Especially with this information being a focus of last year’s required General Update and Broker-in-Charge Update courses and with the directions provided in the Commission’s publication, “Residential Square Footage Guidelines”. Steven L. Fussell, Senior Consumer Protection Officer, in the Commission’s Real Estate Bulletin for May 2018 writes an article entitled “Square Footage Errors.” The article addresses multiple problems that can be caused by a listing agent who copied the square footage from tax records into MLS. Mr. Fussell provides the facts of a recent Commission complaint where the MLS contained the incorrect square footage. “Square footage misrepresentations have the potential to affect more people than just the buyer of the property being misrepresented,” says Mr. Fussell. He continues to summarize the damage of incorrect square footage by pointing out that these mistakes can affect buyers, sellers, brokers, appraisers, and lenders. Brokers and appraisers who have used sale prices of the flawed comps when preparing a CMA, BPO, or appraisal may have encountered incorrect market values or expected selling prices for the properties being evaluated, due to the misstated square footage for the comps. In need of a live real estate or appraisal CE class? Check out our schedule to see our upcoming classes. Looking for an online alternative? We have many online appraisal and real estate classes to choose from. Realtors are not surveyors and most just simply do not know how to measure and compute square footage. I think those that use tax records for most anything, even land area square feet or acres are misrepresenting. Realtors are not qualified to measure even after reading the Commission publication and taking your 4 hour course. Just pay a surveyor to do it and certify to it. This is the safest, most accurate. Mel, thanks for the note re: Residential Square Footage”. A problem that RE agents have long ignored. Years ago I was involved in a situation where it cost the listing agent several thousand dollars because she had not measured the property, the property sold using her GLA, and the buyer sued her for the difference in her GLA and my GLA. This has been an on-going problem for years and some of our agents do not know how to hand the problem. Some a few have taken to hiring appraisers to measure properties prior to listing but they are few. Classes are a solution if they are attended, a BIG if!! Some sort of fines ( hit them in the pocketbook ) would be one way of policing this old problem but not necessarily a good solution. There is no incentive to do it right with the current rules. We need a better system whatever that might be. It is not rocket science!!!! But it can be crucial to the transaction. Thanks for the interest. 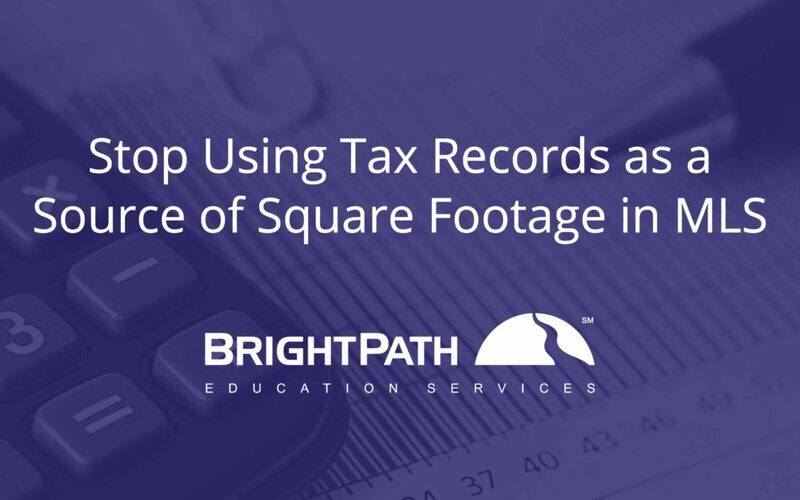 I would like to second the idea of not totally relying on Tax Records for square footage. I believe it the is the responsibility of the agent to measure the home/subject in order to make sure they get the proper information. However, in my home county I will say that our tax system is fairly accurate as we measure every home and building as it is being built. We also track all changes to the square footage to the best of our ability. Recently when we were undergoing a revaluation, we took to the field and physically remeasured all the homes and smaller buildings in the count. I did a significant part of them myself and it took 18 months just to do my part. Tax information is only as good as the people inputting the information. Some areas are good some not so good. It all depends on the staff working the area. Here’s a good example. CMLS listing 3383966 listed gla as 1003 and stated the gla was from tax records. The tax records state gla as 1096. The last previous listing stated gla as 1003. I measured the condo to be 1069.